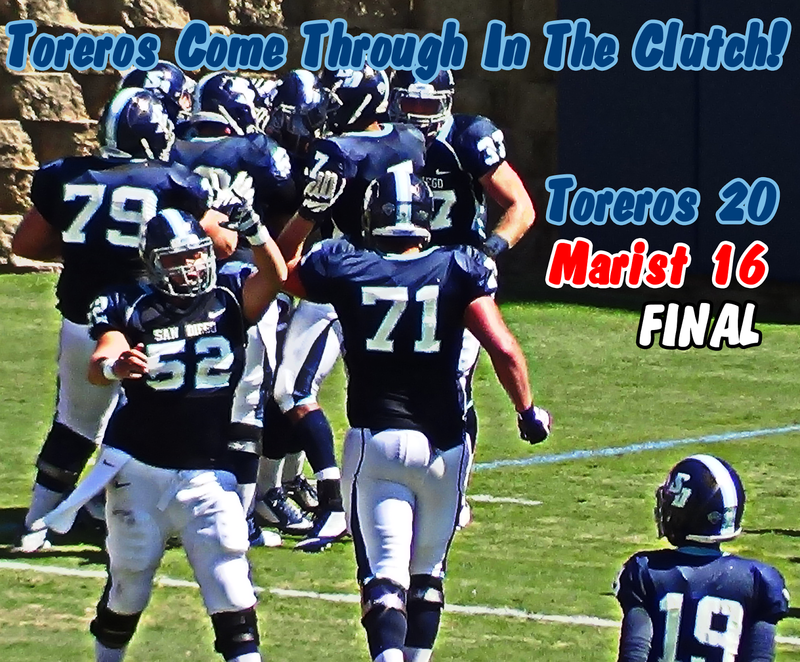 POUGHKEEPSIE, NY (09/27/2014) Trailing 13-16 with five seconds left to play, the San Diego Toreros (3-1, 1-1 PFL) found another way to steal a win from the Marist Red Foxes (0-5, 0-2 PFL). Facing 4th down-and-6, quarterback Keith Williams found senior receiver Reggie Bell wide open for the 36-yard game-winning touchdown. This marks the second straight contest between these teams to be decided within the final seconds of the game. Last season David Last nailed a 28-yard field goal as time expired to give USD a 35-33 win at Torero Stadium. The Toreros are now 10-0 all-time against Marist with the last five of six games being won by seven points or less. The Red Foxes got off to a 13-0 start early in the second quarter after a 34-yard touchdown pass from quarterback Anthony Francis to receiver Armani Martin, and a fumble recovery returned 34 yards to the end zone. A 23-yard field goal by David Last cut the Marist lead to 13-3 at the half. In the third quarter, a two-yard end zone dive by Chris Campano sparked a 10-0 USD run that included a 20-yard field goal by Last that tied the game 13-13 early in the fourth. Marist answered back with a field goal of their own to regain the lead 16-13 with 9:15 left to play. After forcing a Torero punt on the ensuing possession, Marist drove down to USD's 29-yard line where they failed to convert on fourth-and-4. With the Toreros out of timeouts, a first down would have sealed the game for the Foxes. Instead the Toreros drove 71 yards on eight plays in 53 seconds for the game-clinching score. Following a bye next week, USD returns to Torero Stadium on Saturday, October 11th to take on the Stetson Hatters in it's first PFL home game of the season.